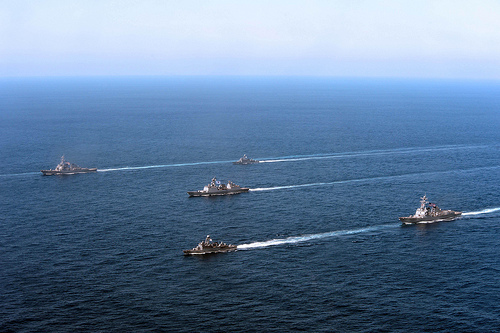 PACIFIC OCEAN - U.S. forward-deployed naval ships from Destroyer Squadron (DESRON) 15 and Republic of Korea (ROK) navy forces concluded their participation in exercise Foal Eagle 2013 (FE 13), March 21. Foal Eagle 2013 was an integrated exercise involving U.S. military and ROK forces to include USS John S. McCain (DDG 56), USS Fitzgerald (DDG 62), USS McCampbell (DDG 85) and USS Lassen (DDG 82) of DESRON 15. Both nations worked closely to increase readiness to defend ROK, protect the Asia-Pacific region and maintain stability in the Korean Peninsula. The exercise focused on strengthening military-to-military relationships and improving command and control in areas such as air, undersea and surface warfare. "This exercise is a bellwether of our interoperability and ability to achieve desired effects in the joint and combined battle space around the Korean peninsula," said Capt. Paul Lyons, DESRON 15 commodore. "ROK [Navy] sailors and U.S. 7th Fleet Sailors were able to interact and work closely with one another, furthering our level of understanding and cohesion as we work shoulder-to-shoulder to achieve unity of effort against a common purpose." The U.S. Navy continues to conduct key military exercises with ROK to improve the capabilities of both Armed Forces since the ROK/U.S. treaty was signed Oct. 1, 1953, which ensures peace and security in the region. "Power projection of the U.S.-ROK alliance and continued support of our agreements is extremely important," said Cmdr. Scott McClelland, Lassen's commanding officer. "Because we do not have any forward-deployed naval forces in ROK, the U.S. Navy must support these types of exercises to ensure the interoperability of naval forces is maintained at the highest levels." While in port, DESRON 15 ships and ROK Navy sailors participated in sports tournaments, local community service projects, ship tours and conducted military-to-military engagements, including the liaison exchange of ROK and U.S. Navy sailors who embarked on board their counterpart's ship to participate in the exercise. Prior to FE13, the ship's crews worked extensively by conducting internal drills to refresh and gain tactical skills that helped in executing the exercise. "This kind of training is truly invaluable for our Sailors," said Cmdr. Thomas Dixon, USS McCampbell commanding officer. "This exercise is the perfect opportunity to strengthen our Sailors' bilateral operability, capabilities and understanding, as well as interact with our ROK counterparts on both a personal and professional level." McCain, Fitzgerald, McCampbell and Lassen are part of the seven Arleigh Burke-class guided-missile destroyers and more than 2,000 Sailors who comprise DESRON 15, which is forward-deployed to Yokosuka, Japan, to support regional security and stability of the Indo-Asia-Pacific region.